With a weeks holiday spare I decided on a combined fishing / storm chasing trip to the seaside town of Yamba on the north coast of New South Wales. Yamba would be a better situated base for potentially severe storms then my home town. The trip takes 11 hours of driving. We left on Saturday 15th of November at 4am. Thunderstorms were forecast in a trough stretching across southern Queensland and into New South Wales. A weak cold front had passed my home at 10pm the previous evening. I knew that this front would stall somewhere north of the Central Coast. This would enhance storm activity. Next morning during the trip north, signs of any front were completely gone by the mid north coast town of Taree at 10.30am. There was however some patchy rain in the trough area, to the west clearing had occurred and already cumulus was forming in the clear areas. However, the trip to Yamba took us through to the other side of the trough which appeared not to be favouring storm development. 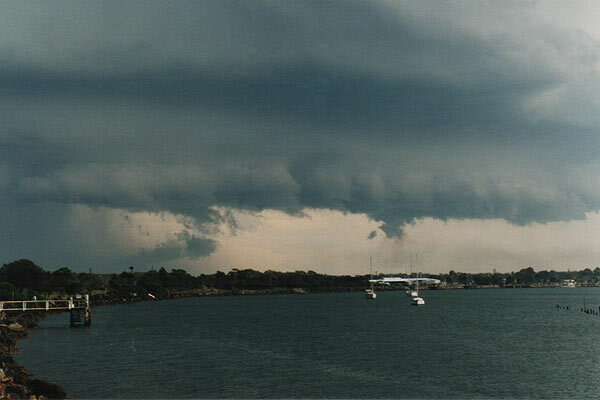 That evening a severe storm advice had gone up for the mid north coast. At 9pm I drove to a tall headland and could see lightning a long way to the south. I kept an eye on the storm over the next 2 hours whilst I took a refreshing swim at the beach. The storm had moved almost to the coast by now. When it was close enough to hear distant rumbles of thunder I decided it was time to think of a possible chase. I raced to the cabin and grabbed my camera. In the short few minutes that it took to get the camera gear several CG's on the rain free north side of the storm had taken my attention. I decided that the best option was not to chase as such, but stick right where I was. This proved to be a fortunate move. Whilst initially it was a round a CG's that grabbed my attention, I now focused on a downdraft area to south west, the speed at which it was moving and its general features indicated that possible downburst activity was happening. I managed to get several good shots of this powerful downdraft. I later learnt that this event caused widespread damage to sugar cane crops at Palmers Island, completely flattening large areas. There was some reports of minor structural damage and trees uprooted. 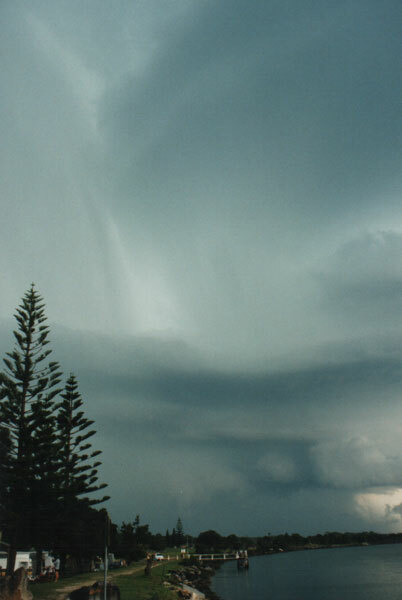 My view to the south was obscured by large Norfolk Island pine trees, therefore I was taken by surprise when the odd large hailstone started falling. I was expecting hail, ( see the portrait photo ), but still thought I had about 10 minutes. I beat a hasty retreat back to the cabin. Hail was a mixture of sizes from pea to around golfball. Hail fell for about 2-3 minutes before any rain. The wind rose to about 40 knots. The storm lasted about 15 mins, before passing out to sea. 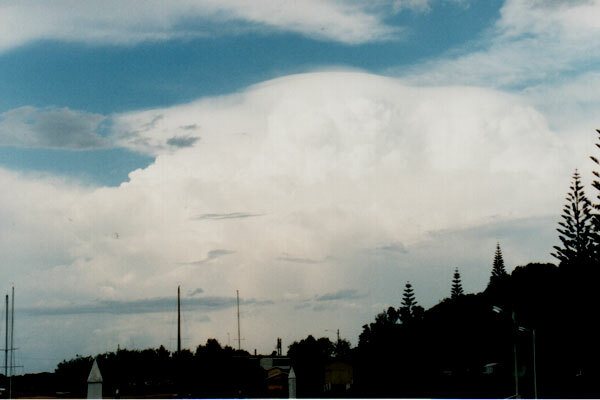 I was very surprised to see that the rear end of the storm ( see pileus photo above ) was quite tame looking. I doubt that the storm was a supercell. It appeared to be multi-cell for a start, I saw no rotation either. 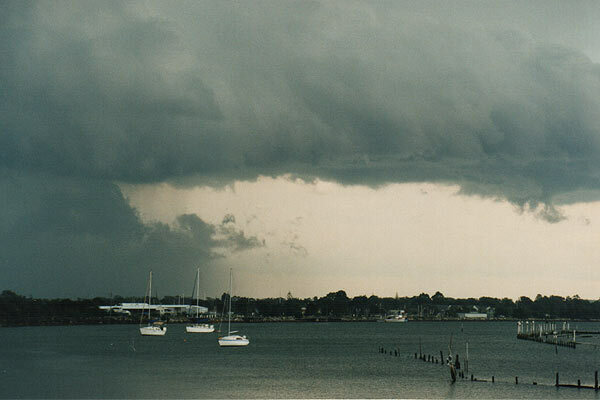 Reports started filtering in about the serious damage that this storm caused earlier at Grafton. Local media reports indicate damage running to $3 million. 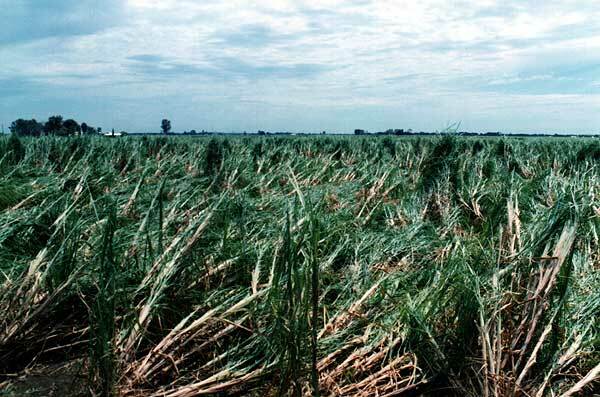 This was not counting any rural crop losses, only town damage. The Grafton suburb of Junction Hill bore the brunt of the storm. This occurred at approx 1pm, a full two hours before the photos above. As well as numerous roofs, some houses received major structural damage. Local estimates indicated winds to 160kph. 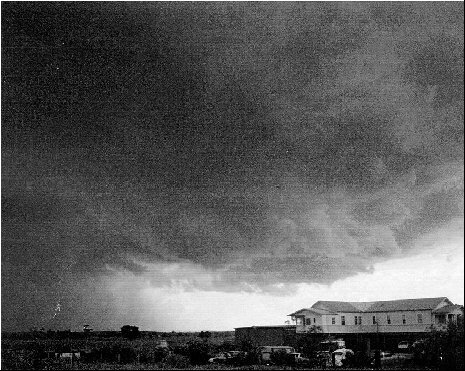 The trip around the district later in the day showed that Yamba had been spared the worst. At Palmers Island there were large areas of sugar cane crop flattened. Where there were trees, leaf and twig litter was almost completely covering most of the road. A few small trees had been uprooted. I drove several kilometres southwards on Palmers Island and all damage was straight line. Cane was laying east - north east, indicating west to south west wind direction. Most of the photos above were taken at Yamba looking up the Clarence River towards Palmers Island. Driving home a week later and I noticed that the small town of Ulmarra had also seen severe winds. To the east of town many casuarina trees lining the Clarence River had been uprooted. 9am Sunday morning was a typical summer day, with the feeling that it was going to be another very hot and humid one as it had been for the past two weeks. We decided to stay at home and watch the surf carnival on TV. 11.30am was the first hint of a potential storm brewing to the southwest of Grafton - thunder. Midday brought grey skies with a very large black roll cloud approaching. 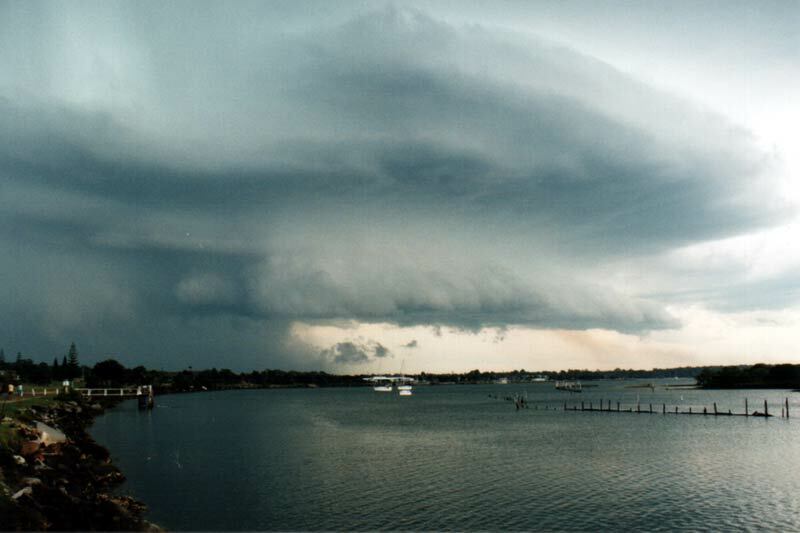 I watched it for some time and it seemed to be dissipating and it looked like any other normal summer thunderstorm. Boy were we wrong in the greatest way! 12.30pm and 36 degrees: the grey sky closed in so rapidly in the next 10 minutes it caught everyone by surprise, the thunder had stopped and there was a kind of brief calm, and it looked like yet another storm had fizzed out over us. Then, all hell broke loose! The wind at first was brief then came the rain. There was just enough time to close windows and doors if one had been watching the storm. The wind picked up again, followed by what seemed to be an enormous white cloud approaching that appeared to consume everything in it's path. 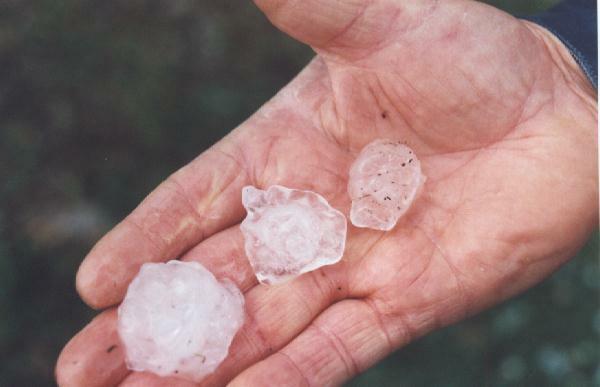 We soon discovered it to be a blast of marble sized hail that continued for the duration of the event. The wind became stronger and as I glanced at the wind speed indicator, I was horrified to see it cease to operate at 206 km/h! Some flying object took off the arm completely, and the temperature had plummeted to 21 degrees. By this time the whole house was literally shaking - ours being a brick and tile structure - still did not console the utter fear of the terrific noise of literally tons of marble sized hail travelling at that speed for a total of 16 minutes just seemed like an eternity. The chilling crash of our armour plate glass windows was the first evidence that the storm was starting to tear the place apart. As I looked out toward the garage I saw the rola-doors being torn from their tracks. The neighbours roof tiles were being worked like a giant bellows waving up and down at will, cascading cement and tiles crashing against the back fences until the fence could not stand the pressure any more, and was eventually lifted out of the ground and flattened. At the stage where anything would and could have happened, a sudden quiet descended upon us. As quickly as it came, it went, within ten minutes the sun was shining as if nothing had happened. It was then that we like hundreds of other home owners came out cautiously to survey the things that remained. We as all others were thankful that only one person was injured. 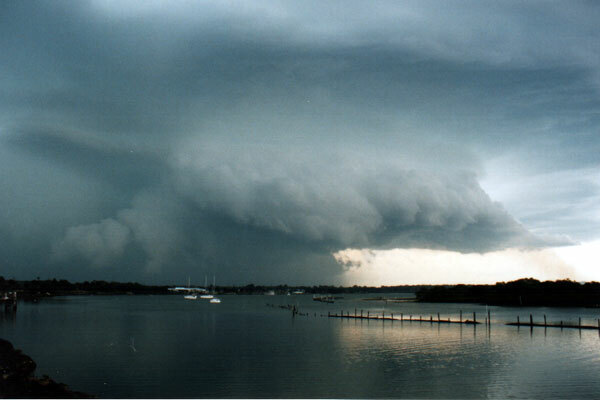 This event was observed at the Brisbane Bureau of Meteorology, some 280 km north of Junction Hill. We were advised that this was a downburst of cold air and ice that descended from a height that was recorded at more than 21km. It also had some tornado like tendencies in the way that it screwed trees off some twenty feet from ground level, in a random pattern through a poplar plantation. There were many hundreds of such stories that have been recorded as a result of this event, which lasted 50 minutes and covered an area half a kilometre wide and 60 kilometres long. An experience that I don't wish to ever have again.